14 Jazz & Funk Etudes (B-Flat Instrument (Tenor Sax, Soprano Sax, Clarinet)). Composed by Bob Mintzer. For B-Flat Instruments (Tenor Sax, Soprano Sax, & Clarinet). Instrumental Series. Jazz; play along. Book & CD. 40 pages. Published by Alfred Music (AP.EL03950).ISBN 0769233570. 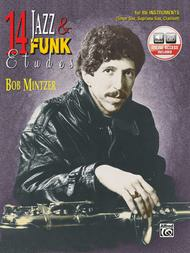 Jazz; play along.Written by jazz musician Bob Mintzer, 14 Jazz & Funk Etudes presents practice and performance aids and explanations in a variety of jazz and funk styles. In addition, the books include a CD containing combo accompaniment that's ideal for practice sessions.Recorded Acc. Available.